Hi! 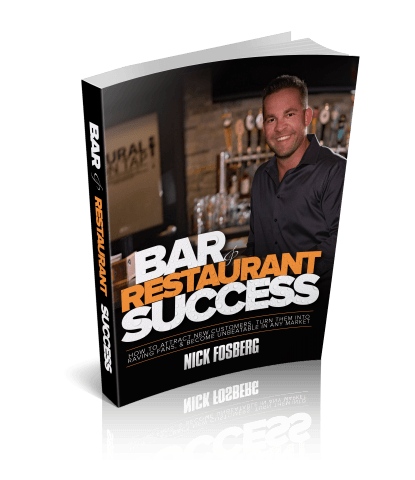 My name is Nick Fosberg and I’m the Founder of Bar Restaurant Success. I’m 33 years old. I live just outside of the Chicagoloand area with my amazing wife Michele. We have two kids, Leighton and Aubrey and a pitbull named Capone. Is this guy or Bar Restaurant Success worth my time & attention? For many of you, the answer is NO. For some reason, a lot of people get into the bar or restaurant business thinking this is going to be easy and they’ll make a ton of money. Bottom line, they get into this business for the wrong reason - The money. Today, I spend about 5 hours per week working on both of my bars. They run themselves. I can leave to the Bahamas for a month, sip on tasty cocktails all day, and the bars will keep producing a nice living for me and my family. However, it took hard work and dedication. It took thousands and thousands of dollars in trial and error and coaching from my mentors to get to where I am today. With that said, If you’re not prepared to commit to roughly 10 times more effort than you’re expecting to be successful in this business, I’m not your guy. If You Don’t Want to Spend Money On Advertising, You’re Not Going to Enjoy My Stuff. No I don’t sell advertising, but here’s why I’m telling you this. If you’re not 100% happy with the money you’re making, being the smart person you are, you know that marketing is the ONLY answer to get new & existing customers in your doors, quickly. But the problem is, you’ve probably been hit hard with failed marketing attempts. Spending $500-$1,000 in the newspaper, online, mailers, radio, etc, and see no return. Then you look to “free” social media strategies because that’s where all the hype is right? And because it’s FREE. There’s no risk. Does some of the “free” methods work? Maybe. In the short term. But if you rely on those strategies, you don’t have a business. You have a strategy that’s supported by an unattainable gimmick that’s a waste of your time. If you want to waste time go binge on Netflix. It’s more fun. Look, the bar and restaurant business is HARD WORK. I’m known as the “marketing and promotions” expert in the industry. I can bring new customers to you all day long. That’s not hard. All you need is a great offer, targeted to the right person, with a marketing message that gets them to take action. Three things. That’s it! What’s hard is making sure they have a great experience when they walk in your doors so they want to come back over and over and tell all their friends and family about how great you and your business are. Yes, once you have the effective marketing strategies working and they are attracting new customers, and you and your staff is giving them a great experience through service and promotions they enjoy, it can be just like you imagined: Passive revenue and money while you sleep. But that takes HARD WORK to create and it takes HARD WORK and discipline to maintain. Free Actionable marketing strategies & promotions you can use grow your bar or restaurant business. I like to call it the old “Actually Help People Before Asking For Their Money” trick. Well, the smartest thing to do is just take a look at my free stuff that’s on my blog or take advantage of my book for free (more on that in a second). If you like my free stuff, you’ll probably like my paid stuff. If you don’t like my free stuff, you probably won’t like my paid stuff. Well, I bought it after 9 months of searching for private lending and waiting for the finale of my dad divorcing my mom for THE 2ND TIME. Long story short, 8 months into owning my first bar, I’m writing a check to my Bud rep and I don’t have enough money in the account. Not a good feeling! First thing that hit my mind was my wife and son (Aubrey wasn’t born then). I couldn’t fail them. I couldn’t let them down. I started thinking about what my friends and family would think of me. What did I decide to do? Become a marketing junkie. The marketing I was doing wasn’t working. So I reached out to small business marketing books, courses, seminars, etc. I started seeing patterns in certain strategies that were “proven” to work. I started applying them with minimal investment because I was “scared” of not seeing a return. However, I started to see some results, but it wasn’t enough. Finally I decided to go all in and pay $8,000 to a marketing coach for full day consultation in Atlanta. I was scared as hell, but I felt I had nothing to lose. I trusted him as he had already helped me through over the phone coaching. Within 8 months of working with my marketing coach, I doubled sales by him helping me apply a very simple 3 step marketing system to my business that I could automate, and that allowed me to eliminate any risk to my marketing dollars. I started focusing more on my customers wants and needs - NOT my own pocket book. Then I started to deliver on what they wanted, which built loyalty and relationship - very powerful business strategy might I add. After I had put marketing systems in place to attract new customers and turn them into loyal customers, and after I created systems and processes my managers could follow to run the bar for me, my marketing coach gave me the idea to help other owners who were once in my shoes. And that’s how I got my start as a “marketing guru” and started Bar Restaurant Success. I’m now the “go to guy” when it comes to attracting new customers online and offline - then turning them into loyal repeat customers through “relationship” based marketing messages that builds instant trust and credibility. Over the last few years, I’ve created some of the highest grossing promotions in the industry using ZERO ad dollars. $10,000 to $30,000 in sales just from 3 E-mails alone and the funny thing is - I use the same e-mails with every client. We just change up the offer a bit based on their business / brand. And because of this, is the reason why I’ve been asked to speak on these strategies and promotions at the Nightclub & Bar Show in Vegas and for the National Restaurant & Bar Show in Chicago - to help provide massive value and “how to” knowledge to their audience. My main focus is to help you turn advertising into profit by using automation. I’m the creator of something called “Loyal Regular Value Optimization” or LRVO for short - which is the marketing formula I used to double my bar business and create the highest grossing promotions in the industry using zero marketing dollars (keep in mind, we spent money to build our email list with promotional offers and then used that list to market our promotions that created these sales surges). It is, in my opinion, the Holy Grail of marketing - because it eliminates almost any risk to your marketing dollars and allows you to get the highest ROI over time. No, I’m not asking you for money right now, I’m asking you to Sign up below, no charge, and get the first 3 chapters of my #1 selling book Bar Restaurant Success - How To Attract New Customers, Turn Them Into Loyal Repeat Customers, & Become Unbeatable In Any Market. After you read these first 3 chapters, I will then make my first “sales pitch” to you which is I will ship you a free physical copy of the book in the mail vs paying $30 on Amazon. All I ask is you pay $5.95 to the fullfilment center who ships them out for me. If you are to get the book and you think it’s the worst thing you’ve ever read…. Just send me a email and I’ll refund your money and you can keep the book or toss it. Please Tell Us Where To Send The Free Chapters & What Role You Play In The Industry So We Can Customize The Content We Send You.